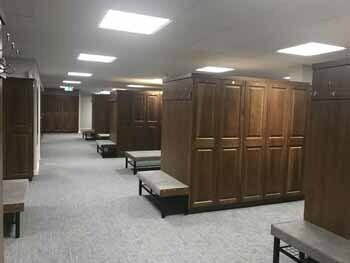 The Jersey venue has completed a £3.5 million clubhouse refurbishment, turning the building into one of the most spectacular locations in UK golf. 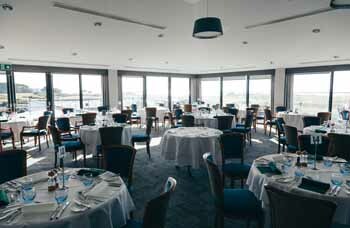 A much anticipated £3.5 million renovation of the clubhouse at La Moye Golf Club on Jersey has been completed to the wide acclaim of members and visitors. 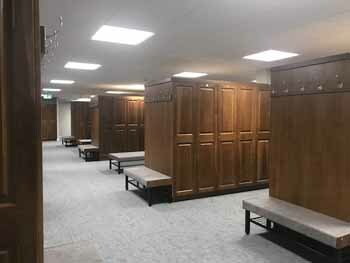 The 12-month project involved a comprehensive redesign, refurbishment and extension of the existing clubhouse to bring the building’s interiors and support infrastructure up to modern quality and standard. 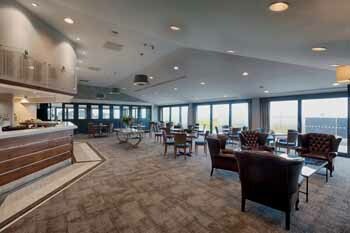 Work included an overhaul of the mechanical, electrical and plumbing installations; the roof was replaced and a new entrance and lounge extension were added. External cladding, selected to ensure that the building sits sympathetically in its natural surroundings, was fitted to sections of the building, transforming its appearance. 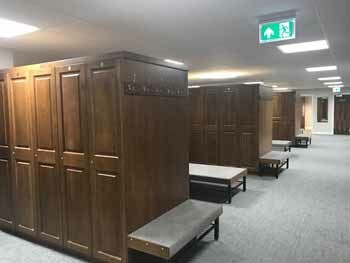 The clubhouse’s lower ground floor features a fully refurbished men’s locker room, men’s showers, snooker room, stores, plant rooms and staff area. 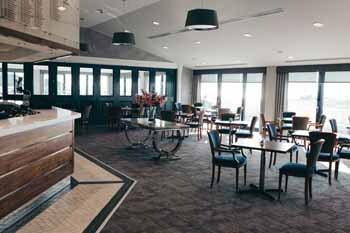 The ground floor houses the bar, lounge, lounge extension, dining room, terrace, administration areas, meeting room, foyer, kitchen and ladies’ locker room. The upper floor has two staff apartments. 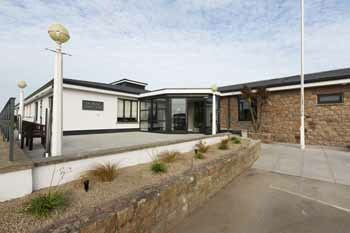 La Moye Golf Club is situated within Jersey’s Coastal National Park, an area that has been given the highest level of protection from development. 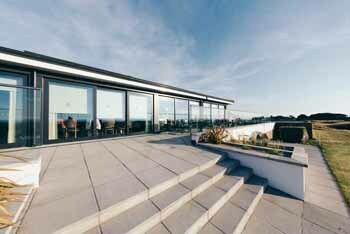 Consequently, the scheme had to demonstrate there would be no impact to the surrounding landscape – and the result is a modern day classic that blends beautifully with the dunes and rolling coastal hills overlooking St Ouen’s Bay. 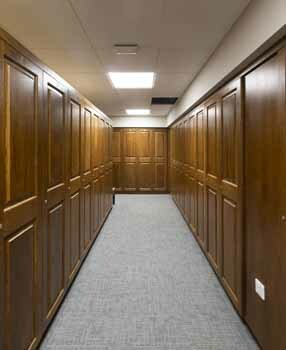 Among the works was the refitting of the men’s locker rooms and bar area by industry leader Ridgeway Furniture. 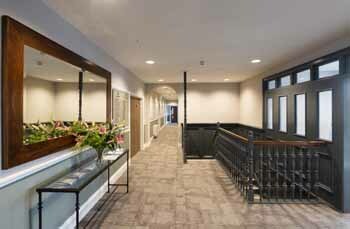 Paul was delighted with the work completed by Ridgeway. 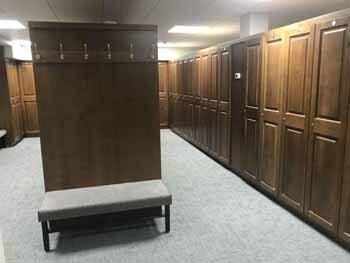 He said: “La Moye GC is a very busy place on a daily basis but with the inclusion of corporate and charity functions throughout the year the locker area can often become very hectic with the arrival of up to 70 to 80 visiting golfers at the same time. 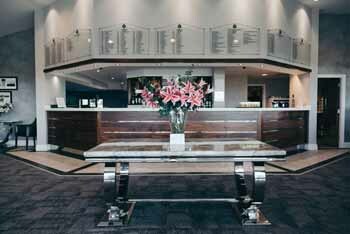 “We needed to provide a facility that was extremely functional but we also wanted it to have a luxurious ‘country club’ feel to it and Ridgeway certainly helped us to achieve this. We had to alter the layout and design slightly on a few occasions and they could not have been more helpful. Having to provide haulage and shipping for all their materials over to the Channel Islands was not an easy task but it was not a problem for them. They also provided accommodation for their excellent fitters during their time in Jersey. 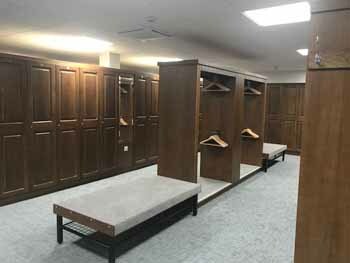 Since its inception Ridgeway has manufactured tens of thousands of lockers that have been installed in some of the most prestigious golf clubs in the world. 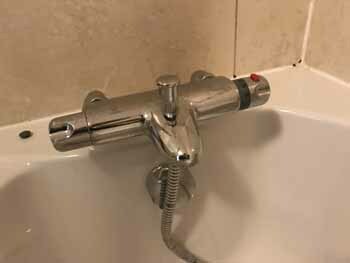 The company has seen turnover increase by more than 100 per cent over the past five years and has invested more than £500,000 in a new factory increasing its capacity by over 50 per cent. 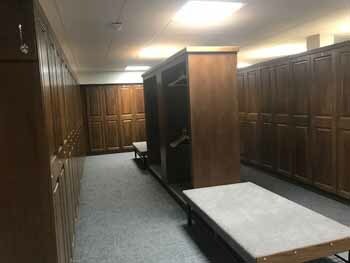 The facility, at more than 18,000 square feet, means the company is now the UK’s largest dedicated manufacturer of wooden lockers. The original golf course at La Moye was laid out by George Boomer in 1902, who was the schoolmaster of Harry Vardon and Ted Ray, as well as his son Aubrey. The course was redesigned by James Baird in the 1930s and reopened by Vardon. The course was virtually laid waste during the World War II occupation of Jersey by the German army. 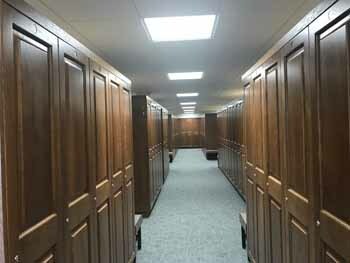 Major renovations took place during the 1960s and 70s under the guidance of Henry Cotton with the site going on to host some of the world’s top golfers. Further development of the course continued with the Martin Hawtree re-designing the 10th, 11th and 12th holes. These holes were opened for play in April 2012. 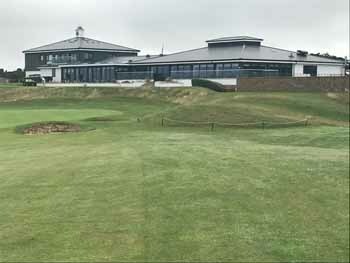 The club has hosted several prestigious tournaments including the European Tour’s Jersey Open between 1978 and 1995 and the Jersey Seniors Classic on the European Senior Tour since 1996.